The aging process is occurring rapidly in Asia. Changes that occurred over 50 years in the West are being compressed into 20 to 30 years in Asia. The number of people aged 65 and above in Asia is expected to grow by 314% from 207 million in 2000 to 857 million in 2050. Singapore is no exception. Singapore’s median age has risen from 24.4 years in 1980 to 38.9 years in 2013. Life expectancy has jumped from 72.1 years in 1980 to 82.5 years in 2013. The median age is projected to keep increasing. Singapore’s age distribution is shifting significantly. In 1970, just 3.4% of the resident population was aged 65 and over. The proportion crossed the 10% mark during 2012-2013, and in 2014 it is 11.2%. Singapore’s old-age support ratio has dropped dramatically from 13.5:1 (20-64 year-olds per senior) in 1970 to around 4.8:1, and by 2030 the ratio is predicted to decline further to 2:1. Singapore is one of just seven fully urbanized places – a city state without a hinterland. In the 1960s, 20,000 farms still occupied about a quarter of Singapore’s land area and produced vegetables, fruits, rubber, tobacco, spices and orchids. Pigs and poultry were reared. Farmers have since made way for infrastructure projects, housing and industry. Currently Singapore imports over 90% of its food. Singapore’s small agricultural sector produces primarily eggs, fish, poultry and vegetables. Ornamental fish and orchids are produced for export. Singapore’s high dependency on food imports makes food security a very prominent issue. The Singapore Government’s Agri-food and Veterinary Authority (AVA) has in place strategies for the diversification of food sources and (given the lack of space for traditional farmland) the boosting of the local production of leafy vegetables, fish and eggs through intensive agricultural technology. 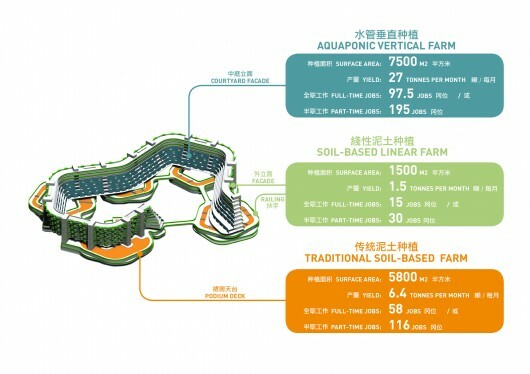 Home Farm adapts a simple aquaponic system inspired by that which has been successfully used in Singapore by rooftop farming initiative ComCrop using off-the-shelf components. At Home Farm, aquaponics have been adapted for use on the building façade. 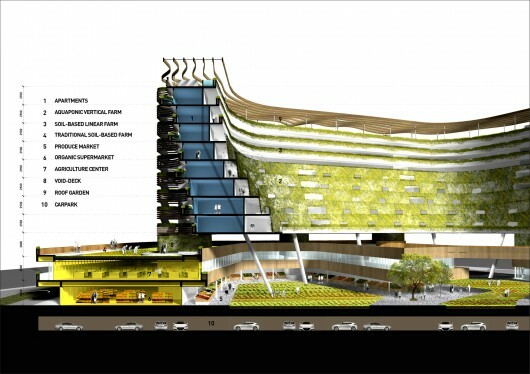 Soil-based farming is proposed for linear planting beds at the highest levels, as well as the rooftops of facilities buildings. Jobs for seniors at Home Farm could include planting, harvesting, sorting, packing, tours, sales on site, delivery, cleaning, and so on. Possibilities for the remuneration of Home Farm’s resident workers could include: payment of salary, offsetting rental or utilities bills, offsetting healthcare costs at the on-site clinic, or free produce. Home Farm is imagined as a private rather than public entity, but one that is within the reach of seniors who encounter financial stress. The architecture has been conceived for economic construction using simple materials and modular parts. 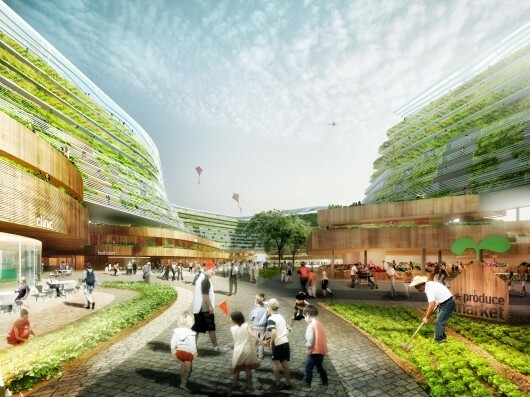 The concept offers multi-dimensional benefits related to economics, food security and quality, social engagement, health, sustainability, place making, and healthcare provision. Next postSo, How Do We Make Sustainability… Sustainable?